My “Ballparks of Northern Ohio” journey continued Monday, July 17. With this stop, I visited a park I thought I was very familiar with but my eyes were opened up to a myriad of fun facts and adventures. My journey took me to Huntington Park, home of the Triple A affiliate of the Cleveland Indians, the Columbus Clippers. Located in the historic Arena District in downtown Columbus, Huntington Park is truly a sight to behold. It has won numerous awards for being one of the best ballparks in Minor League Baseball. Joe Santry, Director of Communications/Media Relations for the Clippers and team historian, took me around to all of the must-see spots within the park. He also filled my head with stories of signal origins, the origin of the term ‘southpaw’ and other baseball facts that, to me, were even more fascinating than taking in the game being played between the home squad and the Buffalo Bisons. The Bisons, the Toronto Blue Jays’ affiliate, won the contest by the way, 7-5. On our in depth tour, Santry took me to the areas that everyday spectators can see and gave me an exclusive behind-the-scenes look into some of the unknown and unseen areas that a ticket purchase does not grant you. As a fan, it was like a dream walking up through the lower levels and into the Clippers’ dugout while the game was happening. I also met the president and general manager of the Clippers, Ken Schnacke, in his suite. Fun little fact, Mr. Schnacke asked me about my Graders hat. Another fun fact: During our tour, a man proposed to his girlfriend and thankfully she said “yes”! After my tour, Santry and I separated and I was free to take in the game from any open seat, but my thoughts and my stomach were set on getting some dime dogs. Dime dogs?! Yes, you read that correctly! On select home games on Monday nights at Huntington, they have a now legendary Dime-a-Dog night. At certain concession stands throughout the park, you can pick up the staple of America’s pastime and can do so in five-dog increments. That is just one of the many promotions the staff in Columbus offer spectators when visiting the ballpark. For information on promotions, ticket prices and anything else you might want to know before your trip to see the Clippers, visit www.clippersbaseball.com. Now, what to experience and to expect at a Clippers game down in Columbus. Ticket price: $7-$25; ticket costs vary based on age (seniors and children at a lower rate) and seating preference. “All you can eat seats” are available for just $25 and are a steal at that price. A special note: Fans can purchase a Family Day Admission on the day of the game at the gate. That will admit two adults and up to four youth, 18 and under, to the bleachers, lawn, or standing room for $15 or purchase reserved seating for $25. Parking: Parking for a Columbus Clippers game is not controlled by the team. However, parking can be found close to the ballpark for anywhere from just $3-$5! This rate may vary if the LC is having a big concert or event. What to see: Everything! If you are 21+ and don’t have the kids with you, check out The Clippers Crafthouse in the AEP Power Pavilion in the left field area of the park. New in 2017, it’s located on the third floor and has an exclusive menu, bleachers like at Wrigley Field in Chicago (home of the 2016 World Series Champion Chicago Cubs) and my favorite, craft beer. Tickets for this section are just $10 and also contain a $5 voucher to be used for food or beverage. Do you want a behind the scenes tour of Huntington Park? Well you’re in luck! To book a tour, email Joe Santry at JSantry@clippersbaseball.com or call him at 614-722-1133. Note: tours are not available on game days. Fun little sidebar again: While watching the game, I ran into Galion Graders relief pitcher, Clay Davies! Hungry? Thirsty? Huntington Park has food options from your usual baseball fair; pretzels, hot dogs, etc. to Donatos Pizza, Bob Evans (not the typical menu) and City Barbecue. At the park, Pepsi products are served and if you’re looking for an adult beverage, they offer up the standard; Bud Light, Budweiser, etc. to Columbus Brewing Company, Leinenkugel’s and even some cocktails, if that’s your sort of thing. Another nugget of knowledge that is useful, especially if you plan on attending a game with the little ones and don’t want to break the bank: Huntington Park allows you to carry-in your own food and beverage, within limitations of course. Here are the specifications from the Clippers website: Soft-sided coolers are permitted but not hard-sided coolers; also no alcohol, glass bottles or cans will be permitted. Small bags or backpacks of food items and beverages in plastic bottles will be permitted. Note: everything is subject to inspection/search. It was an interesting evening out for me on Monday and, as with all of my trips to Huntington, was a great night out! Going to a baseball game and not leaving flat broke or having to really budget a trip is a tremendous feeling. Watching the talent on the field, guys that have already played in the Majors or inspiring professionals, is an experience that baseball fans, novice or otherwise, should take in. You can do that in a little over an hours drive down at Huntington Park. In conclusion, I would like to extend a special thank you to Mr. Santry, Mr. Schnacke and the entire Columbus Clippers staff for the opportunity to explore Huntington Park. 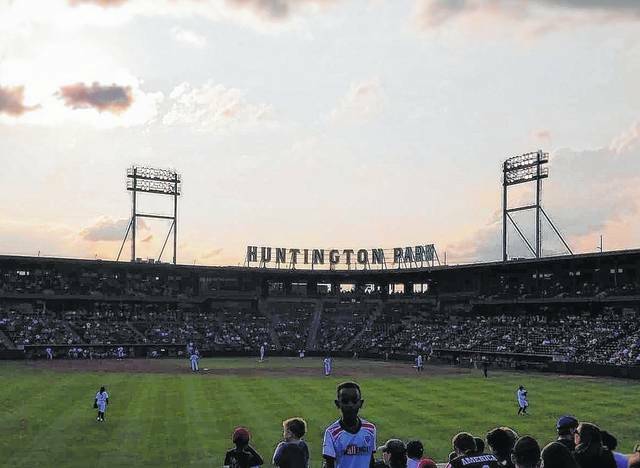 Huntington Park is more than just a place to watch a baseball game.